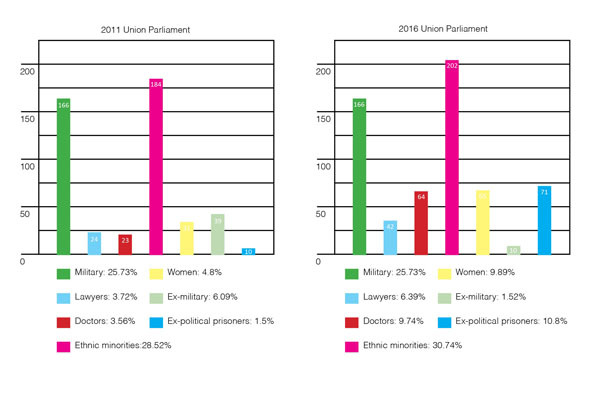 The Irrawaddy’s researchers put together a few visuals to illustrate the composition of the new legislature. On Feb. 1, Burma will have a new Parliament with a fresh political order. As the current session wound down on Friday, many lawmakers from the Union Solidarity and Development Party (USDP)—which held a majority of both houses over the past five years—left the assembly for good. 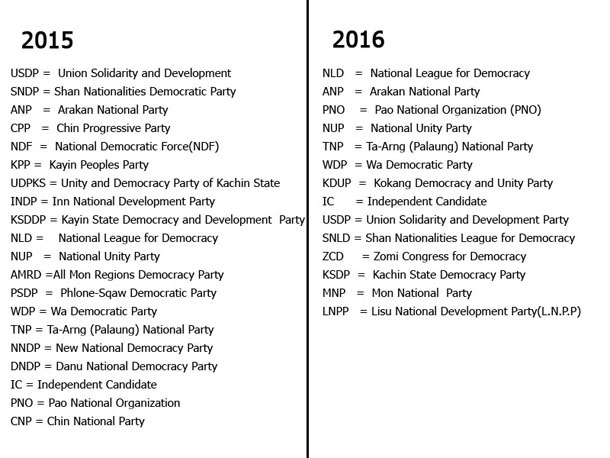 Only 41 USDP members will sit in the new Parliament, which will convene on Monday, some old and a few new. Aung San Suu Kyi’s party, the National League for Democracy (NLD), will assume 390 seats, enjoying a majority in both houses after a landslide win in the Nov. 8 general election. Those gains account for 80 percent of all contested races. The party only held 43 seats in the outgoing Parliament, which they won in a 2012 by-election. The NLD-led legislature will bring an assorted set of lawmakers including ethnic minorities, academics and former political prisoners. The number of women in Parliament will have doubled from 31 to 65. Despite the drastic diversification of elected seat-holders, one thing will remain the same: The number of military representatives will be 166. Research compiled by Wai Yan Aung.